The H10 Salou Princess is located in the lively area of Salou, near the beach and the PortAventura amusement park and its excellent golf resort. It has a wide range of services for family holidays such as pools for adults and children, a Jacuzzi, a children‘s park and an entertainment programme with activities for all ages, not to mention three other excellent golf clubs within a half hour's drive. 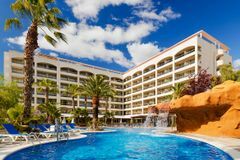 Whether you want to hit the fairways or relax by the pool, the H10 Salou Princess hotel is ideal. It enjoys an excellent location in one of the resort's liveliest areas, next to the Plaza de Europa with its many shops and restaurants. There's a beach just five minutes away, and a bus stop outside the hotel - which means you can get to Portaventura in less than ten minutes. At the hotel, you've got a large lagoon-style swimming pool that has a lush tropical feel thanks to the palm trees around the edge of the water, and there are plenty of high quality sun loungers scattered around and a waterfall cascades from a rocky terrace above, providing a relaxing ambience. There's also a pool bar, plus the luxury of a Jacuzzi, a sauna and a play park for children. There are 327 rooms in total, and they are airy, bright and modern. Each has an en-suite bathroom, balcony, telephone, satellite TV, safe, heating and air-conditioning. You can also ask for a small fridge at an extra charge. The superb restaurant offers Spanish and international dishes and the grill, cooks daily specials such as barbecue chicken or griddled lamb chops. Elsewhere is the Sport Legends pub, which is a great spot for an after dinner drink.